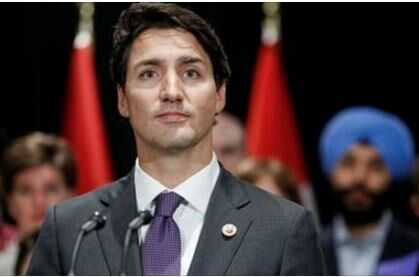 "We have been assured that Canadian citizens travelling on Canadian passports will be dealt with in the usual process," a spokeswoman for Mr Trudeau said in an emailed statement. US President Donald Trump's National Security Adviser Mike Flynn "confirmed that holders of Canadian passports, including dual citizens, will not be affected by the ban," the statement said. Canada's Immigration Minister Ahmed Hussen is a dual national who arrived as a Somali refugee. 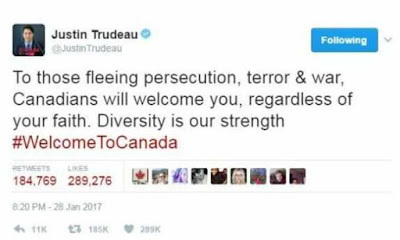 Within hours, Mr Trudeau's tweets had been shared more than 150,000 times. 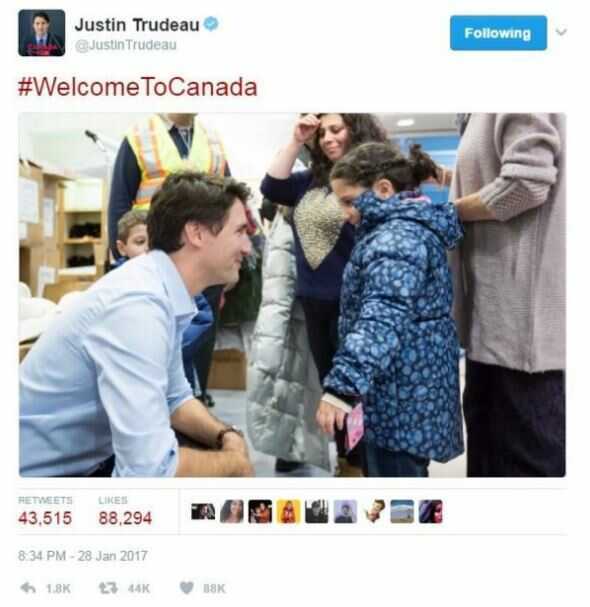 "Welcome to Canada" also became a trending term in the country. Mr Trudeau, who gained global attention for granting entry to nearly 40,000 Syrian refugees to Canada over the past 13 months, also sent a pointed tweet that showed him greeting a young refugee at a Canadian airport in 2015. The US's entire refugee admissions programme has also been suspended for 120 days. Those fleeing Syria as refugees are banned until further notice.